We look forward to another amazing learning experience for 4th – 9th graders from the Maya population in the mountains of Quiché. Many of these students are on scholarships provided by Pura Vida, and are all eager to improve their English fluency through games, songs, and conversations. 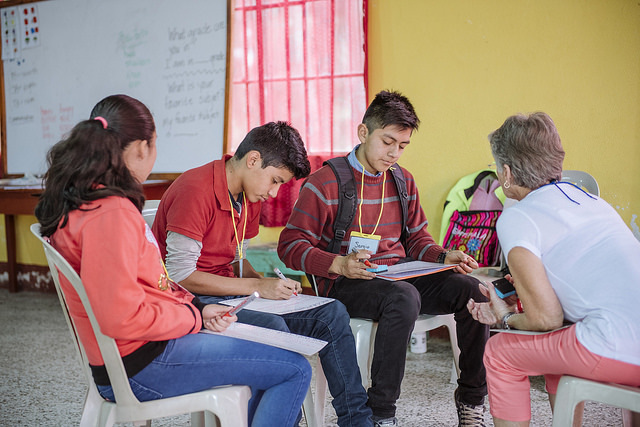 We usually have three classes divided into small groups of 3 – 5 students, so volunteers work closely with small groups using provided materials. Applications and deposits must be received by February 15th. Thanks to a great response to our “Double your Impact” matching donation fundraiser, we were able to take nearly full advantage of the $15,000 pledged in matching funds. As a result, we were able to meet all of our financial obligations for 2018. Thank you donors and match providers! We appreciate your support. We emailed year-end receipts on January 23rd. If you made a donation in 2018 and don’t see you receipt, be sure to check your junk mail folder. Would your church or organization like to hear from us? We can provide a speaker to talk about our programs in Guatemala and opportunities for involvement. Please contact us for more details.